Get your pencil moving and your imagination unstuck with this book! In the mood to doodle but have no clue what to draw? Get your pencil moving and your imagination unstuck with this workbook! 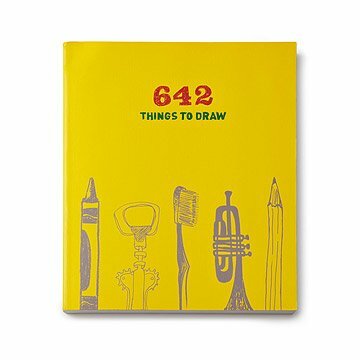 Whether you're an art school grad or a debutante drawer, "642 Things to Draw" offers prompts that will fuel your inspiration and develop your artistic mettle. From rolling pins to robots, this book will offer you plentiful ways to occupy yourself during your next 3-hour conference call, lecture, or car ride. Printed in China. Please note: Offers text prompts, not visual prompts. My son is a creative 13 year old, and this book was probably his favorite book ever. I usually don't post reviews but I felt compelled to do so because this was the perfect book for a kid who loves to draw but often is looking for a prompt: "What should I draw". The things he came up with based on the ideas in the book are fabulous. It's now his go-to activity whenever he has free time. This book is not going to work for someone whose creativity you hope to foster-it's really for a person who already is very creative and artsy. For a kid who would rather draw than do just about anything, I think this book is a fantastic choice.